The team at Edge Structures takes Responsible Business very seriously not only in the way that we carry out our professional duties but also in the contribution we make to the community at large and to the environment. We believe that environmental considerations to make a positive impact through our work should be a given as it should for all businesses. Where we strive to make a further difference is through our link with key charitable organisations where we use our skills not just as engineers but as human beings to have a direct impact on improving the lives of others. We believe in giving our time and money to benefit others and the following are just some of the ways in which we do this. Homelessness is a real problem in London and beyond and can strike people from all countries and all social backgrounds. Winter night shelters have been established across London to provide emergency shelters through the coldest months of the year. 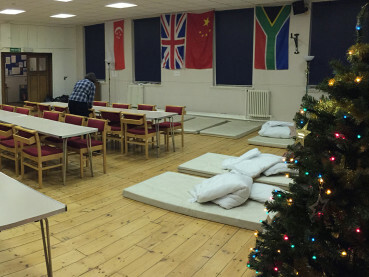 They typically operate in churches on a rolling programme so seven churches at a time will each open their doors to referred guests to provide a warm dry place to sleep, a hot meal, friendship and where possible a shower. 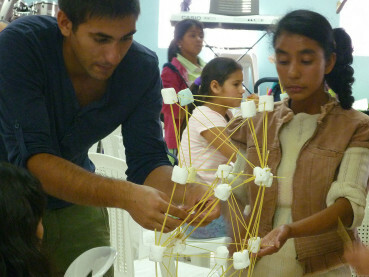 The team at Edge Structures has volunteered since 2013 for the period leading up to Christmas staffing a venue in King’s Cross for the evening, night and morning shifts, providing and cooking the food, making the beds, talking and playing games with guests, staying overnight then serving breakfast and clearing away in the morning. This work is remarkably rewarding as we make friends with people whose lives we see changing for the better and is a great way of building a stronger team ethos within the office. 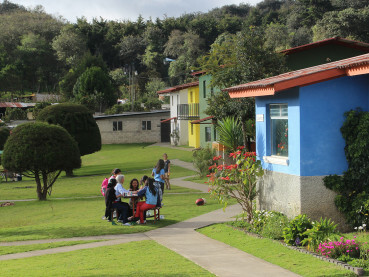 To find out more about the shelter visit www.c4wshomelessproject.org or investigate similar shelters in your area. 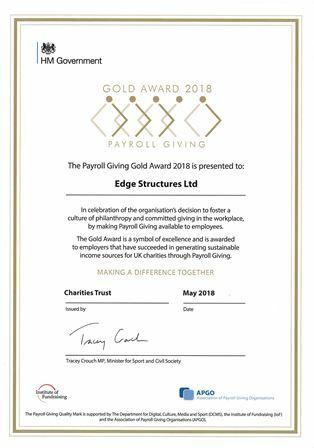 In addition to the charitable activities undertaken by our team and the donations made directly by the company, Edge Structures operates a Payroll Giving Scheme to encourage team members to give to charities of their choice. The company matches employee donations up to 10% of salary so employee generosity to others is made even more effective. Edge Structures efforts to encourage philanthropy were recognised in 2018 with a Gold Award Mark recognising our commitment to Payroll Giving and CSR. Edge Structures is committed to giving opportunities for young people who wish to find out about careers in civil and structural engineering. Every year we offer work placements for school students where we work hard to give a real taste of what it is like to work on live engineering projects. We also support engineers from our team to give talks at schools, colleges and universities to explain about their role as an engineer, how that fits within the construction industry and what paths are available to find work in similar roles. Building on an existing relationship with a school in West London, we are now looking to create an opportunity for a school leaver to join us at 18 and continue part time studies while training as an Engineering Technician.